Growing up, my mom made accordion potatoes on special occasions. I loved them because they seemed super fancy but also their shapes were totally appealing and very kid-friendly. My mom always sprinkled the tops with breadcrumbs which made the tops extra crispy. We always called them accordions but they are also known as hassleback potatoes – named after a Stockholm restaurant where they originated from. Years ago, I made these for a dinner party and they were a huge hit. Everyone loved the crispy exterior and the soft insides, plus they were sprinkled with garlic, salt, herbs and swimming with butter. What’s not to love? When we had our Thanksgiving dinner a few weeks ago, I decided to give accordion potatoes another go, but I cut down on some of the butter and subbed in some olive oil. I decided to leave out my mom’s breadcrumbs to keep things simple. Once again, they were a huge hit. I large potato is more than enough per person, but you could easily double this recipe for a crowd. I’ve been making these potatoes forever and I’ve learned a tip to make slicing the potatoes so much easier and stress-free. Line up 2 chopsticks lengthwise on either side of the potato, so when you cut your slices, you don’t end up slicing all the way through! elsewhere: If you’re already tired of salads from summer, think again. Over at Poppytalk I make a delicious salad using greens, beets, carrots, apples, nuts & seeds and my favorite pink vinaigrette. Get the recipe! 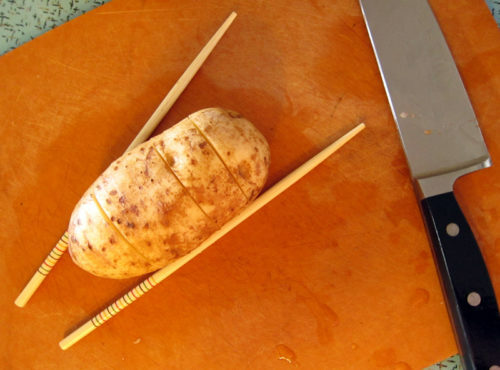 Line up 2 chopsticks lengthwise on either side of your potato on your cutting board. Slice each potato at 3-4mm intervals – basically as thick as a really thick chip, but if you cut slightly thicker slices, that’s okay too. Carefully place potatoes on a lightly oiled glass baking dish. In a small saucepan, let the olive oil, butter, garlic, garlic powder and herbs melt together. Brush liberally over potatoes, making sure to get the butter/herb/oil mixture into the crevices. Sprinkle with salt and pepper. Bake for 45-65 minutes or until potatoes are tender & crispy. This brought a smile to my face. The chopsticks are very clever—I was wondering. YES! I’ve always wanted to try these. The chopsticks are a great, great idea. Thanks for sharing! I think I like what you call them “accordion” better! Great tip too! 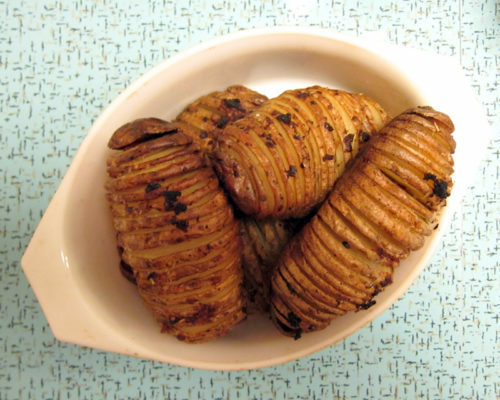 I love hasselback potatoes. I made these last weekend for a friend, and used only olive oil, garlic, salt, and pepper and they were soooo delicious! I like the chopstick method. I cut mine in a wooden spoon, but it wasn’t entirely successful. This was a special treat last year — to make and to eat, and both Dan and I really enjoyed it! I think the recipe I used called for shoving little slivers of garlic in between each layer, which was insane for delicious flavor. Brushing with flavored butter sounds intense as well. These need to make a comeback here. Hi Jeanette, just popping by to let you know we’ve got you up in the FBC member directory and we’re so happy you joined! These potatoes are one of my favourites but the chopstick tip is awesome – thanks! I loooove hassleback potatoes! I never thought to use chopsticks to stop from cutting through the entire potato. I’ve gauging it with my eyes the entire time – geesh! Yum, I love hassleback potatoes! Great idea with the chopsticks! Thanks Tracy, it’s a great trick – something I should have learned ages ago. NicoleD, yes, give them a try!! So good! Jacqui, that’s how I knew them as and I like accordion so much better as a name! Bijoux, I’m totally going to try out your mom’s potatoes. And you should try my mom’s too! We’ll have a mom-off! Tanvi, I’ve tried the wooden spoon thing, but it didn’t work well for me. I always ended up slicing some bits off. This is way better, trust me. Wow, Heather, love the tip about shoving garlic in between each layer. Wow, that’s a lot of work but totally worth it! hassleback potatoes are my favorite go-to when I’m hungry and don’t want to cook. I love putting a raw jalapeno between some and whatever fresh herbs I have on hand. mm. so good. Whoa – this took me back! Love them, but never make them for some odd reason. THANK YOU for the chopstick idea. I’d been putting them in a wooden spoon, but it was a bit of a wobbly method. This looks like it’ll be quicker and safer. I’ve never actually HAD hasselbacked potatoes but I love looking at them…and I’m sure I’d love eating them, especially after you describe those crispy outsides and soft insides. I agree–those chopsticks are genius! I’ve been thinking about hasselback beets–maybe I’ll try that with the salad you mentioned at Poppytalk! Love it! Easy, hearty, versatile…these will happen this weekend. Happy Friday, my friend. I agree, the idea to use chopsticks to guide your knife is brilliant! I normally make these with yukon gold potatoes but I’ll bet they’re great (maybe even better) with hearty russets. Lovely. Great idea to line up the chopsticks so you don’t cut too far! I had never heard of hasselback potatoes until about a year ago. I love the idea. What luck! I am planning to make these this week. I have tried to make them once before, but had a terrible time without knowing your clever chopstick trick. Thanks to you my second attempt is already looking better. Caroline, love the jalapeno tip! Jennie, that sounds scary if it wobbles and there’s a knife involved! Chopsticks all the way. It’s all kinds of awesome, Joanne! Gretchen, it would be a great pairing! try them out and let me know what you think. Yay, Megan – hope you baked up a couple. Elizabeth, I’m sure they are awesome with YGs. I’ll give them a go too. That was always my problem too…until the chopstick discovery. Works perfectly. Ashley, they are delicious and I’m sure you’ll love them. I know you will – universal potato love!! Glad I can assist, Elizabeth! You probably should give those potatoes a good rinsing after cutting them up and then drying them before brushing on (and in) the butter: all that extra starch will make the slices stick together more than they need to. Every time I see a photo of these beauties, I just want to stop what I am doing and make them. I LOVE your chopstick tip. I’ve heard the wooden spoon trick but had trouble envisioning how that would work. Chopsticks it is! Joe, interesting tip! I didn’t find that they stuck together, but I can see if one is using very starchy potatoes it could be an issue. Good to know! Thanks. Wanted to let you know that I have made these the last 3 nights in a row. My husband and I both really liked them and I just happened to have a lot of potatoes. It’s been pretty crazy over here. Such a great tip on the chopsticks! I made them last night and was so very happy! I wrote a quick post and told everyone how much I loved you in it. I hope they come and visit you too. Thanks a million! Hooray Lydia, that’s what I love to hear! Enjoy the potato harvest. Thanks Joanna, so glad you loved them! I LOVE cooking potatoes like this! I love the combination of crispy and creamy textures. I made these tonight and they were delicious! My 12 year old son thinks we should have them every night. Put a link to the recipe on my facebook page too. Love your blog. Thanks Sarena, these are sooo good and i’m just dying for a repeat chance to make them again. Maybe today is the day! Michelle, thanks so much – I love that you and your son love this! Made my day 🙂 Thank you! Sooo sad I didn’t find this in time for Thanksgiving. Love the chopstick trick, too. Do you cover the potato with aluminum foil or no? JD, you don’t need to cover with foil, I don’t – but if you did want to bake them a bit quicker you could try it for the 1st half hour or so and then remove the foil so they brown and get crispy. Your call. At last! Something clear I can undrseatnd. Thanks!